We stock numerous pet care items in our reception area, such as leashes & collars, chew toys, plush toys, and parasite & odor control products. We also have various grooming supplies such as toothpaste and toothbrushes, shampoos & conditioners, dry skin aids, nail trimmers, brushes and combs. You can also get behavior modification products such as Gentle Leaders, treats, Squirrel Dudes, Kong toys, and stuffing products for them. We stock most types of Science Diet and Prescription Diet foods and we can special order most other premium brand foods or therapeutic diets as well. 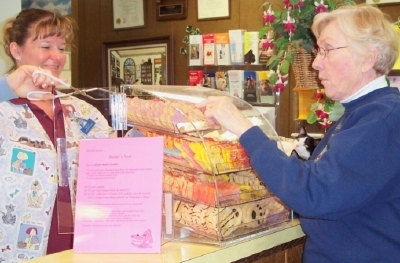 In fact, we are more than willing to special order just about any pet supply item that you might need. Many times our food prices are less than the pet superstores! Because of limited storage space, we do ask that you call a week ahead to reserve food to be sure we have adequate supplies on hand. These foods are guaranteed that your pet will accept their taste, or your money back! For coupons on your first purchase of these foods, click on "Other Features" at left, then "Coupons." You can also order products and foods directly online through our website for home delivery. Just click the purple Online Store link on this page or on the home page. See the pharmacy page fore more details. In our Barker's Nook, we feature various flavors of homemade, Gourmutt dog treats. They are made from all-natural, human-quality ingredients like whole wheat flour, peanut butter, garlic (dogs love it! ), carob (instead of chocolate), and no animal-based products. They make great gifts for your pet-loving friends!